CiviMail has a number of tools for reporting and analysis; indeed reporting is one of the key reasons to use CiviMail. Tracked Opens shows the number of people that CiviCRM thinks have opened the email if you have chosen to track opens. 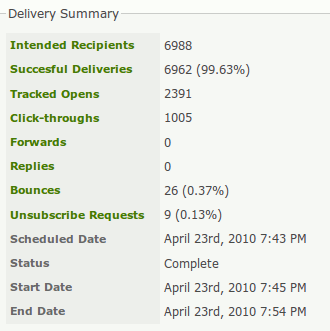 You should review a list of bounces by clicking on the Bounces link in the Delivery Summary. You can see the reasons for individual bounces such as incorrect email addresses (e.g., contact@gooogle.com), fix them and remove their On Hold status. 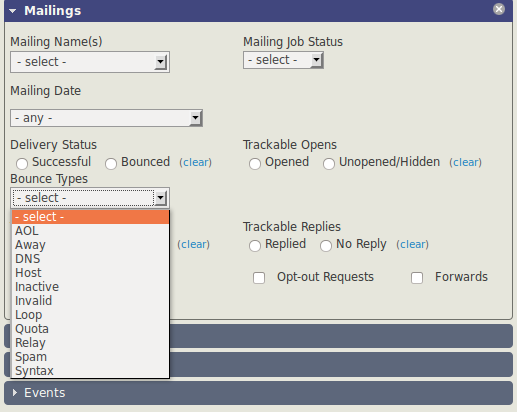 You can then re-use the mailing and simply add it to the EXCLUDE Recipients of These Mailing(s) list on the Select Recipients screen of the re-used mailing setup. You have access to all the other cool features of CiviReport, including the ability to add reports to dashboards, get reports emailed, etc. Read the Reporting section of this book for more information.